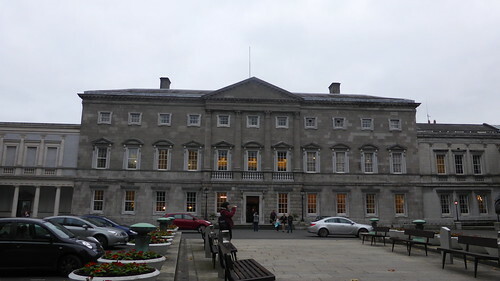 The Oireachtas (the Irish legislature) is comprised of the President of Ireland, Seanad Éireann (Senate of Ireland) and Dáil Éireann (the lower house). The sixty Members of the Senate are not directly elected. The Senate cannot veto laws, it can only delay them. It is located in Leinster House. A proposal to abolish the Senate was defeated in referendum by a narrow margin in October 2013. The earliest known Irish Parliament met at Castledermot, Co Kildare about 10km north of Carlow town, on June 18th 1264. The Irish parliament was in existence in various forms until it was abolished under the Act of Union of 1800. At that time the Irish Parliament consisted of an Upper and a Lower House, the House of Lords and the House of Commons. The House of Lords consisted of hereditary nobles. The Act of Union, which came into effect on January 1st 1801 formed the United Kingdom of Great Britain and Ireland under the Parliament of the United Kingdom in London. There was strong opposition in Ireland to the Act of Union during the nineteenth century. The opposition frequently led to insurrection and there were several attempts made to repeal the Act. Legislation providing for Home Rule in Ireland was finally passed in 1914. 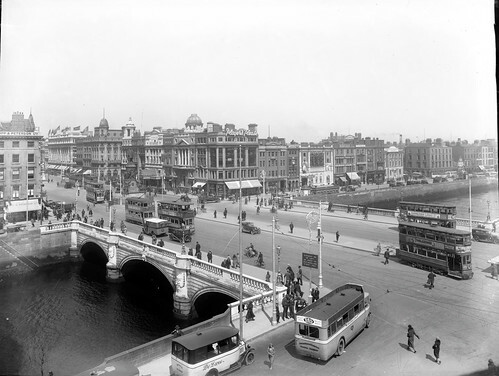 Following the election of 1918, Irish nationalists established a parliament in Dublin which was called Dáil Éireann. In 1920 the Parliament of Southern Ireland was created by the British Government. The Parliament consisted of the House of Commons of Southern Ireland and the Senate of Southern Ireland. It was boycotted by nationalists and was formally abolished under the terms of the Anglo-Irish Treaty of 1922. The Constitution of the Irish Free State provided for the establishment of a bicameral parliament, consisting of Dáil Éireann and Seanad Éireann. Members of Dáil Éireann were elected by proportional representation on the basis of universal suffrage. Members of Seanad Éireann consisted of people appointed by the President of the Executive Council and those indirectly elected by the Dáil. The first Seanad was described by the New York Times as being ‘representative of all classes’. The Free State Senate existed until 1936. It was abolished by the Fianna Fáil government led by Éamon de Valera in that year after it delayed some Government proposals for constitutional changes. It was replaced by the modern Seanad Éireann in 1937. The Irish Free State Senate was abolished in the year 1936 On This Day. 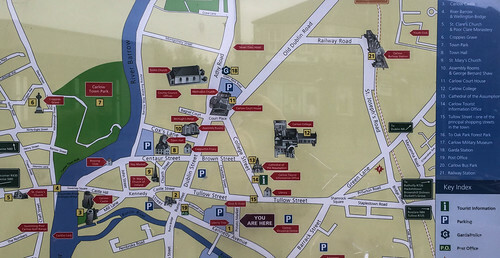 Carlow town located in the South-East of Ireland is about half way between the cities of Dublin and Waterford. Prior to May 2008 over 9,000 vehicles passed through Carlow town every day causing major traffic disruption. Local people were also subjected to traffic noise and pollution. A By-pass for the town was under discussion for many years. It eventually became part of a larger scheme, the M9 Motorway linking the cities of Dublin and Waterford. The Carlow By-pass however was built two years before the M9 was completed. Prior to building the By-pass archaeological investigations were undertaken at 57 sites. The excavations produced evidence of settlers in Carlow from the Mesolithic era, of houses belonging to people of the Neolithic period and sites relating to the Bronze Age. Material relating to the discoveries were put on display in County Carlow Museum which is located in Carlow town centre. The By-pass begins at the Carlow North exit in Prumplestown just south of Castledermot in County Kildare, passes to the east and south of Carlow Town as far as the Carlow south exit at Powerstown. It cost €216.5 million and took 22 months to build. The motorway gave rise to some objections from local people. This was particularly true of the Tinryland GAA Club whose members felt their facilities would be compromised by the development. 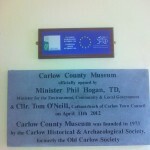 The Carlow town By-pass was officially opened in the year 2008 On This Day. Noel and Liam Gallagher of the rock band Oasis were born in Manchester to Peggy Gallagher (neé Sweeney) from Swinford Co Mayo and Thomas Gallagher of Duleek Co Meath. Noel and Liam have one older brother, Paul. Oasis, which was active from 1991 to 2009, holds the Guinness World Record as the most successful band in the UK from 1995 to 2005. It won numerous awards and was nominated for three Grammy Awards. Noel Thomas David Gallagher was born in Manchester, England in 1967. He was interested in music from an early age and began learning to play the guitar at the age of 13. Having left school early, Noel worked with his father for a time before taking a job with a gas company. He had an accident while working for the gas company and during his recuperation he began writing songs. In 1991 at the age of twenty four Noel Gallagher joined a band called The Rain which his brother Liam had established. 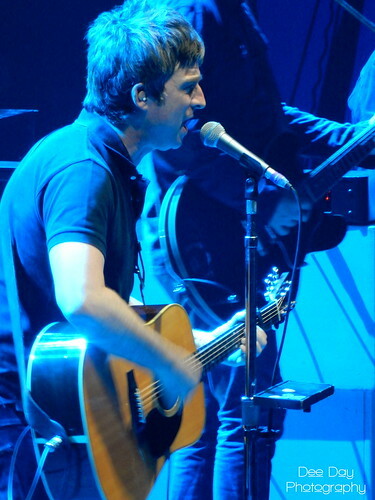 He began writing songs for the band, the name of which was eventually changed to Oasis. Oasis had its first number 1 hit with ‘Some Might Say’ in 1995. Several other hits were to follow including ‘Wonderwall’ before Noel left the Oasis in 2009. Oasis then changed its name to Beady Eye. Noel Gallagher began his solo career when he played at a concert in the Royal Albert Hall in London in 2010 for Teenager Cancer Trust. In 2011 he released his solo debut ‘Noel Gallagher’s High Flying Birds’. He continues to perform but indicated in early 2015 that within the next ten years he was considering retiring from live performances. Noel Gallagher of the rock band Oasis, was born in Manchester, England in the year 1967 On This Day. The Riordans was a long running Irish rural soap opera. It was set in a fictional village called Leestown in Co Kilkenny. The Riordans, which was made by RTE (Raidio Telefís Éireann) was actually filmed in Dunboyne, Co Meath and in other locations nearby. RTE began television broadcasts on December 31st 1961. 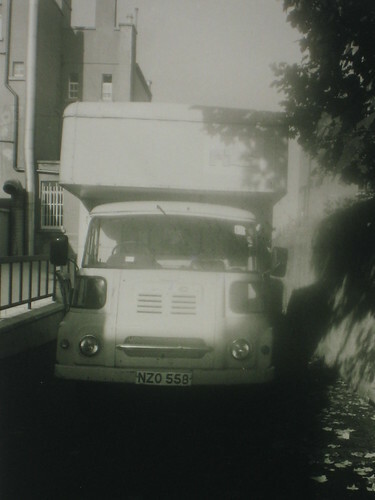 The station had produced a successful urban soap opera called Tolka Row, the first episode of which was broadcast on January 3rd 1964. Following the success of Tolka Row, RTE decided to produce a Rural Equivalent. The Riordans was created by Wesley Burrows and James Douglas. The first episode was broadcast on January 4th 1965. The series ran for fourteen years and in all, 600 episodes were made. At the height of its popularity the Riordans attracted over 1.2 million viewers. Filming of the Riordans was done on location rather than in a TV studio. This was a major innovation at the time. The innovation was later introduced to Britain by Yorkshire Television for the production of Emmerdale Farm. Other productions such as Brookdale, Coronation Street and EastEnders gradually followed suit. The final episode of the Riordans was shown on RTE television in the year 1979 On This Day. Thomas Moore, Ireland’s National Bard, appeared on stage in Kilkenny City, Ireland each year between 1808 and 1810, in charitable performances with the Kilkenny Players. Moore was a poet, satirist, composer and musician who was a close friend of Lord Byron and Percy Bysshe Shelley. During his lifetime his writings, which are still popular today, aroused support in London for Irish nationalism. 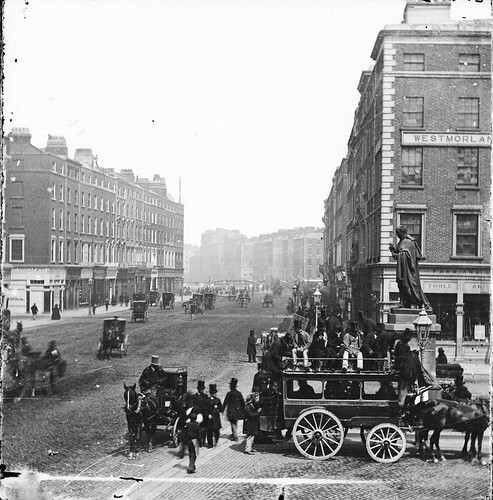 Thomas Moore was born above his parents’ grocery shop on Aungier Street in Dublin in 1779. His father was a native of Moyvane, County Kerry and his mother was Anastasia Codd from Wexford town. Thomas Moore entered Trinity College Dublin in 1795 to study law. He was a contemporary of and friendly with Robert Emmett. However he was persuaded by his mother not to get involved in revolutionary activities. Having graduated with a BA degree Moore moved to London in 1780 to study law at Middle Temple. He became a popular figure in London society and the publication of Odes of Anacreon established him as a poet. Lord Moira became a patron and through his influence Moore was appointed Admiralty Registrar in Bermuda in January 1803. However he did not enjoy the boredom and seclusion of Bermuda and moved to the United States after four months. He toured the United States and returned to London via Canada in November 1804. 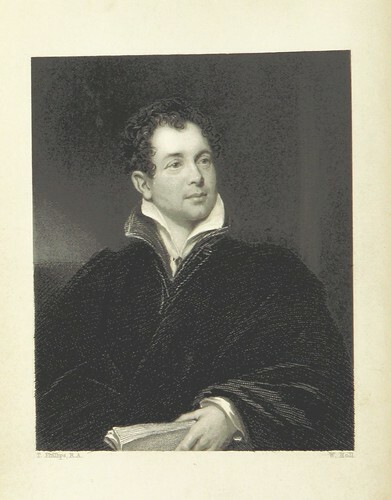 Thomas Moore was a very close friend of Lord Byron. Byron entrusted his memoirs to Moore for publication after his death. However, Moore was persuaded by Byron’s family to destroy them. Moore later celebrated Byron’s life by editing and publishing his letters and journals. Moore wrote 130 original poems. Among his best known are poems such as ‘The Minstrel Boy’, ‘The Last Rose of Summer’ (written in Jenkinstown Park, Kilkenny) and ‘Oft, in the Stilly Night’, which are lyrics written to Irish tunes. As well as writing his melodies Moore also wrote biographies of United Irishman Lord Edward Fitzgerald and playwright Richard Brinsley Sheridan. Whilst performing in Kilkenny, Moore met the actress Elizabeth Dyke. They were married in 1811 and later settled in Bromham, Wiltshire in England. Regarded as a hero by Irish nationalists, Moore is reported not to have liked Daniel O Connell. Moore, who was a catholic himself, was a strong advocate of Catholic Emancipation. When emancipation was granted in 1829 he is reported to have said: ‘Now that the Paddies are happy, I consider my politics entirely at an end’. Moore’s Melodies continue to be popular and are performed to this day. A version of the Minstrel Boy is performed on the soundtrack of the movie Black Hawk Down. Thomas Moore died on February 5th 1852 at the age of 72. Monuments to Moore can be found in several locations including in Dublin close to Trinity College, at The Meeting of the Waters near Avoca, County Wicklow and in Central Park, New York City. Thomas Moore, poet, singer, socialite, balladeer and amateur actor was born in the year 1779 On This Day.